On the 18th January 2019, a ground-breaking 3D immersive exhibit of one of The Glasgow School of Art’s plaster casts was featured on BBC Breakfast. It uses Virtual Reality and Augmented Reality to tell the story of Laocoön (a Trojan priest from classical mythology), which was one of the GSA’s casts damaged in the fire of 2014 and presumed lost following the fire in 2018. The exhibit was created by the GSA’s School of Simulation (SimVis) in partnership with the leading Scottish digital media studio ISO Design, over a period of nine months, thanks to a grant from the Arts and Humanities Research Council (AHRC). The project was informed by the restoration which was carried out on the cast as part of the 2014 Fire Recovery Project. It was inspired by the conservation processes and reports, as well as the rich history of the piece within the School and evidenced in the Archives. The material enabled SimVis and ISO to explore ideas around immersive exhibition experiences using digital technologies. Using VR headsets, visitors can walk through one of the Mackintosh painting studios, where a life-size rendition of Laocoön, created using detailed scans taken after the 2014 fire, can be seen against both historical and contemporary back-drops, using material drawn from the archives. The interactive experience features films, images and an audio narrative to complement the central figure, detailing the cast’s history and conservation process. It is hoped that the experience will be developed further onto smartphones and tablets, in order to enable school students to further their engagement with cultural heritage. 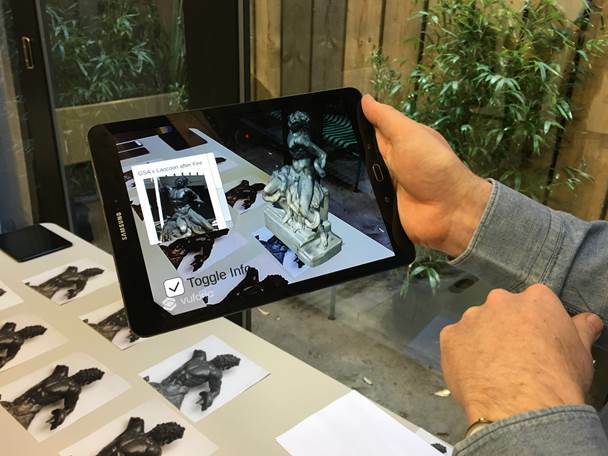 The augmented reality aspect of the project allows visitors to view Laocoön from different aspects and rendered in different materials. Image courtesy of ISO Design. The Laocoön VR experience is an exciting example of how modern technology can go hand-in-hand with archival material to communicate and animate information, documentation and technical data to reach out to visitors in new, engaging and immersive ways.